Trends in Japan is featuring notable personalities in Japan. The subject of our current article is softball player Reika Utsugi, a Chinese-born naturalized Japanese citizen who helped lead the Japanese national softball team to the silver medal in the 2000 Sydney Olympics. 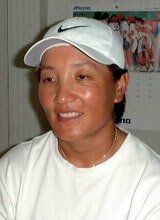 Reika Utsugi, a major star in the world of Japanese women's softball, was actually born in China. A long-time admirer of Taeko Utsugi, a former player who is now the manager of the Japanese national team, she came to Japan in 1988 and since 1989 has been a member of the Hitachi Takasaki Women's Softball Team, also managed by Taeko Utsugi. Reika became a naturalized Japanese citizen in 1995 and represented her new country in the 2000 Sydney Olympics. When Reika decided she wanted to come to Japan, however, she had to overcome the resistance of her father, a former soldier, who was dead set against the idea. She explains, "He asked me why I wanted to go to Japan of all places. But I knew that as long as I could play for Taeko Utsugi, I could enjoy softball there. I realized it was a bit of a risk, but I was ready to take the chance to make my dreams come true." Reika first met Taeko Utsugi, who at the time was a player on the Japanese national softball team, while playing for the Chinese junior women's national team at the age of 15. During a game between the Japanese and Chinese national teams, Reika was taken with Taeko's strong play as she watched from the stands. The following year at the World Junior Women's Softball Championships held in Canada, Taeko served as a coach for the Japanese junior women's national team, and Reika stopped by her hotel room every day for advice. Taeko smiles as she recalls the episode, saying, "She drew a batter's box on a pad of paper and asked me how she should stand. She constantly asked me about hitting. She was the only athlete who did that." After the tournament came to an end, the two stayed in touch via letters and phone calls. 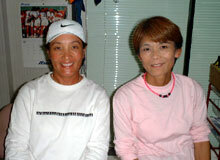 Reika, left, with national team manager Taeko. Reika says that being unable to communicate quickly with the other fielders was one of the difficulties she experienced in softball after first coming to Japan: "There were some games we lost because of that. I couldn't forgive myself for having made my team lose because of my own mistakes." After three months in Japan, Reika broke out in hives as a result of stress. A little unsure of what to do, Reika went to her company's clinic, where she was told that the doctor would not prescribe medicine because she did not have health insurance. Commenting on the rigid stance taken by the doctor, Reika says, "I thought the Japanese were so inhospitable. In China, no matter how poor a person may be, the doctor will provide medicine if the patient is in need." Because she could not receive any medicine, the hives spread to her whole body, and she was unable to do anything for a week. Reika's manager, teammates, and co-workers offered words of comfort, however, and moved by their concern and their efforts to help her, she came to think, "Japanese people are truly kind." There were other cultural differences as well. She explains, "While the Japanese are kind, they don't often speak up for themselves and are sometimes vague." Reika was amazed at this and says that in China she was taught from a young age that "If you don't make things clear, you are the one who suffers, and it creates a nuisance for others as well." According to Reika, this mentality also applies to sports: "Even if Japanese are good at defense, their offense is weak." Softball became an official event at the 1996 Atlanta Olympics. This was when Reika decided she wanted to become a naturalized Japanese citizen so that she could honor her manager and pursue her dream of playing on the world's biggest stage. This time her father in China, who had originally opposed her going to Japan, gave his approval, saying, "You will always be my daughter." When she took her manager's family name and became Reika Utsugi, "Now I've really done it [become a Japanese citizen]," she thought. "Though it was just for a moment, I wondered if I had done the right thing." Reika was then able to join the Japanese national team, but she could not take part in the Olympics. According to the Olympic Charter, an athlete who has changed his or her nationality less than three years ago requires the permission of his or her former country in order to participate. China did not give its approval. Shortly afterward, Reika had to undergo surgery on her right shoulder followed by a difficult process of rehabilitation. She did not give up, though, and her long-cherished dream of playing in the Olympics finally came true in Sydney in 2000, where she hit three home runs en route to helping the Japanese team to the silver medal. Utsugi has had to overcome numerous challenges since coming to Japan from China, but what got her through it all was her devotion to softball. "If there is something you want to do, you can absolutely accomplish it," she says. "The road there will not be easy, but that's to be expected." Her interests are not limited to sports. As part of her effort to learn more about Japanese society, Utsugi began playing the stock market seven years ago. Even when her team is on the road, she checks the financial newspapers. As busy as she is, Utsugi still has no plans to retire. She says, "I'll retire when I start losing to younger players. I'm playing well this season, and that's all that matters." Born in Beijing, China, in 1963 as Ren Yanli. Played for the Chinese junior women's national team and national team. Came to Japan in 1988 and joined the Hitachi Takasaki Women's Softball Team in 1989. Won the triple crown for batting average, home runs, and RBIs in the Japan Softball League in 1994. Became a naturalized Japanese citizen in 1995, adopting the name Reika Utsugi. Hit three home runs in the 2000 Sydney Olympics to help the Japanese national team to the silver medal. Plays third base. Bats left, throws right, and enjoys playing the stock market.